What Is a Final Year Project? At the end of your degree, you will be expected to undertake a piece of unique research of your own to show that you have learned what is expected of you. Each subject and institution have slightly different requirements for writing a final year project and their specific guidelines and requirements should be followed to the letter. Writing bad your graduation project paper will almost certainly mean that you will not be getting a diploma or the degree that you are seeking. Most final year projects will take up the entire final year of your course and you will need to ensure that you work throughout this time to get your paper to the standard that is expected. Not only must you undertake research that is robust and to the standard expected within your field, you must also ensure that your paper is perfect. It must be formatted in the correct academic style, structured according to the expectations of your program and totally free of any errors. Any deviations from the requirements or problems with your writing could see your paper either being rejected outright or returned to you for revisions. 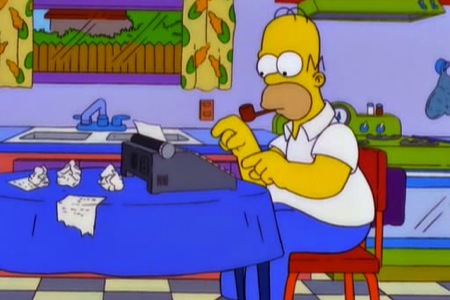 So it is very important that you put in the work to ensure that your paper will be spot on when you submit it. Use sample capstone paper to take some tips from it. Don’t: just launch straight into your project without taking the time to carefully consider the topic that you will study for your project. 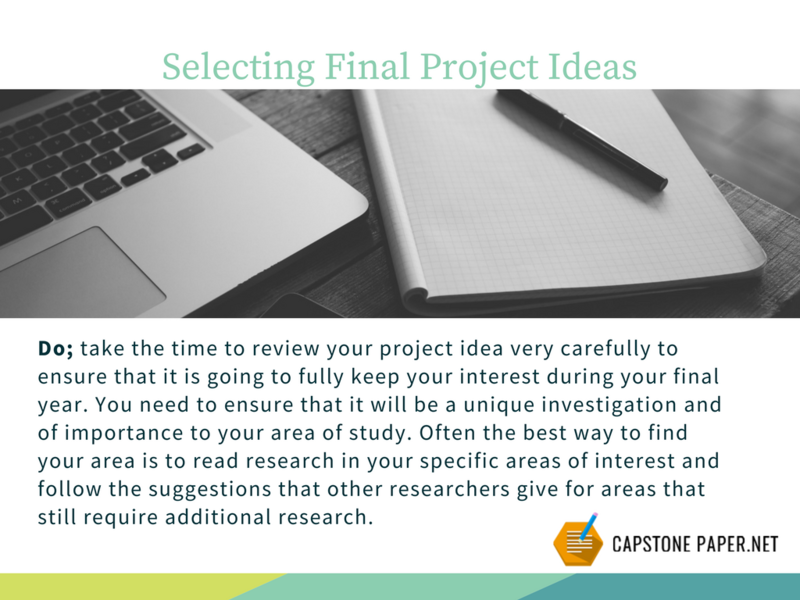 Selecting an area that you are not going to be able to maintain your interest in or a topic that is just too wide or narrow for your research may be a recipe for disaster when it comes to your final project. Do: take the time to review your project idea very carefully to ensure that it is going to fully keep your interest during your final year. You need to ensure that it will be a unique investigation and of importance to your area of study. Often the best way to find your area is to read research in your specific areas of interest and follow the suggestions that other researchers give for areas that still require additional research. Most programs will expect you to submit a final project proposal which will be reviewed and approved by your supervisor or a board before you will be allowed to proceed. Don’t: treat this as a task that has to be completed and just skim through the required sections of the paper with little thought to get this stage out of the way. Also, do not submit anything that contains errors or holes in your thought process as it will be seen as a reflection of what your final paper may be like and your proposal could be denied. Do: treat writing your proposal as the initial stage of your research. Use it as an opportunity to conduct in-depth literary research into your chosen topic to position your own research. It is also your opportunity to carefully plan your research. The better that you map out what you will do the more likely that your research will be successful and easy to conduct. Writing your final year project is not something that you can leave to the last minute if you want to make a success of it. Always create a clear project plan that you then follow. This should be created at the proposal stage of your final project. Do not ignore your plan and think that you can cram in everything in the last few weeks. Outline your project paper clearly so that you have a good idea of what will be included in each section of your writing. This will save you a huge amount of work with rewriting later and give you clear guidance for your writing. Title page: generally this will contain your name, the school and department names, supervisors name and of course the actual title of your research. Plagiarism declaration: many institutions now require that you will provide them with a signed declaration that your work is wholly your own and that you have not included any copied materials. Abstract: this needs to be a brief summary of your entire paper that should be capable of giving any reader a clear idea as to what the paper is about and what it found. Usually, you will write this at the end of your project and writing. Introduction: this provides the reader with a clear idea as to what your paper is about. This may run to several pages and should contain clear sources for any facts and other information that you may cite within your writing. Literature review: This should establish where your own research sits within the available research that is already published. It should give the reader a clear idea as to what is already known and why your own research is important. Sources should be reliable and clearly cited within your writing. Methodology: this section is where you will describe exactly how you went about doing your research and why you choose that specific method or methods. Do not detail out things that you tried and that did not work. Results: this section should clearly break down the findings of your research so that the reader can discover what you uncovered through your research. Conclusions: probably the most important part of your paper. It should refer back to the original aim of your research and must show what was discovered as well as its significance. References or bibliography: this is a full and comprehensive list of all of the sources of information that you have consulted and used within your writing. This section must cover everything that is cited in your writing and must be correctly formatted. Appendix: this is where you will locate all of the reference materials that are relevant to your research rather than having them appear within the text where they may disrupt the flow of the reader. Many students across all disciplines struggle each year with their final project for a variety of different reasons, puzzling themselves with questions like what is nursing capstone and how to survive it. Our specialist help, however, can provide you with the help that you need to ensure that your paper will be completed on time and to the high standards required to demonstrate your practical knowledge in your area of study. Our experts work directly with you through our easy to use services and will tailor the support that they offer to ensure that you get precisely the support that you need. Our help is always provided with full plagiarism testing, proofreading by experts and will always be delivered on time. We offer the highest of standards of work and provide you with a full satisfaction money back guarantee. If you need help with writing a final year project just contact our specialized services here today for the support that can be trusted to deliver the best possible results!